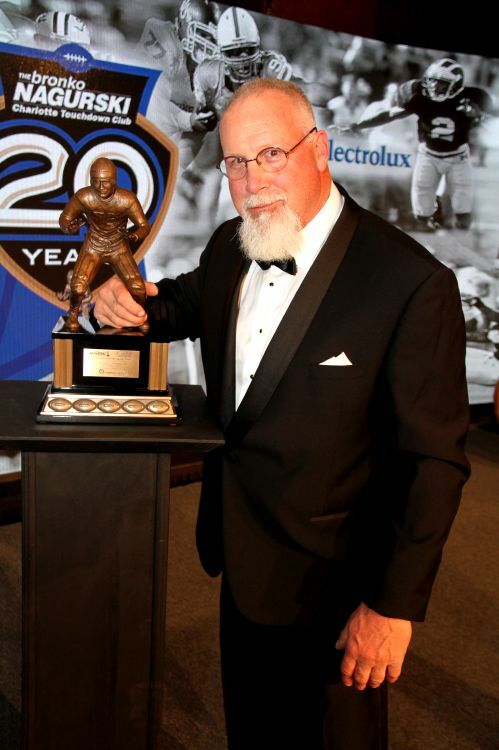 CHARLOTTE, N.C. — Randy White never expected to be honored as a legend in college football. Of course, the highly decorated defensive star for Maryland and then the Dallas Cowboys never really expected to even play college football in the first place. He’d been a star pitcher and first baseman for his high school team in Wilmington, Delaware, and had been told at one time that the Philadelphia Phillies wanted to draft him and sign him for a $30,000 bonus. Even though White said he hit better than .500 in three consecutive seasons at Thomas McCain High School, his dad, Guy White, had never graduated from college. The former staff sergeant and paratrooper in the 101st Airborne who had parachuted in for The Battle of the Bulge during World War II had dropped out of college and become a butcher in Wilmington. His dad had never made more than $10,000 in a year, so Randy was a bit miffed that his dad made his decision for him. White hadn’t been a hot commodity as a football prospect. He’d visited only Arizona State, Virginia Tech and Maryland and chose the Terps because of closer proximity to home. In truth, he liked baseball better than football, too. At Maryland, White became a star defensive player even though he began his career as a 6-4, 225-pound fullback and middle linebacker in high school. Claiborne, an ultra-disciplinarian and one time a strong candidate to replace Darrell Royal at Texas, sized up White and figured he was destined to be an impact player on defense and moved him to defensive end. If nothing else, Claiborne instilled a fierce work ethic and an attention to detail that White appreciated. His coach’s style also better prepared him for life under Tom Landry. To make sure his players understood, Claiborne ran the offenders on the stadium steps early in the morning. “He never got me,” White said. Instead, he excelled his last three seasons, played in two bowl games and won both the Outland and Lombardi awards as one of the best players in college football before getting drafted with the second pick of the NFL Draft by the Cowboys. They didn’t exactly gamble on White. He timed at 4.6 in the 40 on Pro Day and played any number of defensive positions. He thought he’d end up in nearby Baltimore. The Baltimore Colts told White they wanted to take him with the No. 1 pick, but they traded it to Atlanta, which selected quarterback Steve Bartkowski. Dallas swapped quarterback Craig Morton to the Giants for the second pick and used it to take White. The Cowboys, in the process, landed a nine-time Pro Bowler and future NFL Hall of Famer who had more than 1,100 tackles and 111 sacks. Always undersized but highly motivated with a tremendous motor, White played as a 252-pound defensive tackle in the Super Bowl, but he shared co-MVP honors with end Harvey Martin in the win over Baltimore. He’d lose two more Super Bowls to the Steelers under the stoic Landry and still laughs about his coach’s pre-game pep talk before the first loss. White’s not in love with the game that he now watches and comments on for a pre-game Cowboys television show, mostly because he doesn’t recognize it. He’s not sure how many concussions he suffered during his career with the Cowboys. The most memorable one came in a Redskins game when he went to tackle the Washington running back and instead blew up teammate Charlie Waters. White broke three of Waters’ ribs with his helmet. White sat out all of one play after the collision with Waters. Different times, and different mentalities. Since his Cowboys’ career, he has run a barbecue joint and been involved in other businesses. He still lacks six hours toward his degree at Maryland and admits he’s thought of finishing it to say he had a college diploma. Before he showed up in college, he thought he’d end up as a bricklayer. After all, he’d been an apprentice to a brick mason from the time he was 10, and he was making as much as $6.10 an hour, which was more money than his dad brought home. And White knows all about being tough.